Deformable image registration is typically formulated as an optimization problem involving a linearly weighted combination of terms that correspond to objectives of interest (e.g. similarity, deformation magnitude). The weights, along with multiple other parameters, need to be manually tuned for each application, a task currently addressed mainly via trial-and-error approaches. Such approaches can only be successful if there is a sensible interplay between parameters, objectives, and desired registration outcome. This, however, is not well established. To study this interplay, we use multi-objective optimization, where multiple solutions exist that represent the optimal trade-offs between the objectives, forming a so-called Pareto front. Here, we focus on weight tuning. To study the space a user has to navigate during manual weight tuning, we randomly sample multiple linear combinations. To understand how these combinations relate to desirability of registration outcome, we associate with each outcome a mean target registration error (TRE) based on expert-defined anatomical landmarks. Further, we employ a multi-objective evolutionary algorithm that optimizes the weight combinations, yielding a Pareto front of solutions, which can be directly navigated by the user. 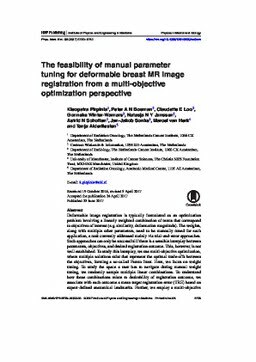 To study how the complexity of manual weight tuning changes depending on the registration problem, we consider an easy problem, prone-to-prone breast MR image registration, and a hard problem, prone-to-supine breast MR image registration. Lastly, we investigate how guidance information as an additional objective influences the prone-to-supine registration outcome. Results show that the interplay between weights, objectives, and registration outcome makes manual weight tuning feasible for the prone-to-prone problem, but very challenging for the harder prone-to-supine problem. Here, patient-specific, multi-objective weight optimization is needed, obtaining a mean TRE of 13.6 mm without guidance information reduced to 7.3 mm with guidance information, but also providing a Pareto front that exhibits an intuitively sensible interplay between weights, objectives, and registration outcome, allowing outcome selection.